My name is Rick and my wife is Valerie, and we just became classic wood yacht owners. To be more exact, we recently traded a 1969 Pontiac Grand Prix,(in near perfect condition for a 1949 Ed Monk Sr. 43 foot yacht,..in need of some serious work. The one thing that makes this yarn worth reading? Neither me or my wife have ever worked on a boat before,..and this one has to be ready for our retirement in five years. 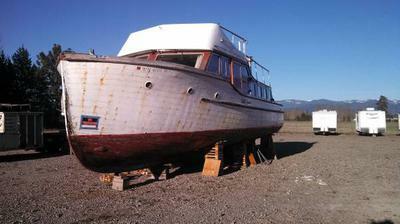 The "Orphan Jewel" is dry docked in Sandpoint, Idaho, and after she's finished we'll be staying in that area. Before you ask,..NO, we don't have any choice but to go this route. We don't have the money to get a down payment for a house, and we are most sincerely NOT rich people. As a matter of fact we live in a hotel room for the time being, and to make matters worse, we are five hundred miles from the yacht until we move to Spokane area in about three months. No money, no way of getting to the project every day, no knowledge of how to fix anything on the Orphan Jewel,.....this is just failure waiting to happen! Did I mention that we don't have any choice is out of the question, because after 2008, the banks are out of the question. So the only other choice we have, if we wish to own a place of our own,..is sitting in Sandpoint. Please don't think that all of this adds up to our not caring about classic yachts,..the truth is we love them. Their grace and beauty goes far beyond anything that anyone can call a possession, and quite frankly, we never thought in a million years we would get this lucky, but the whole job does seem very daunting. Look forward to meeting a few of you,..and I'll be happy to keep everybody updated on how this goes,...until I return, have a safe and beautiful day on the water,..we'll be there before you know it. Your comment has impowered me. We haven't started yet,(still doing reseach. Please allow me to show what i have found. When trading for The "Orphan Jewel" I received a binder about eight inches think of nothing but paper work. I do know the velvet drive was rebuilt in 2000, (thank God)and all the electrical work on the inside is done, (the inside maybe needs around five grand to finish, if I go back to all original) and all the windows are air tight. The biggest surprise comes from a magazine article that was done in 1950 about her first launch. She was built for Frank Hefferman, and at the time he was Commander in charge of the Tacoma Yacht Club. The photo's of her show her first naming, as Frala Lark Bently and at one point won a race from Tacoma to British Columbia. The writer even included pictures of the interior when she was new, and almost nothing has been changed since. She has real brass strips running around the outside edges of the dinning room table, and the kitchen counter top with little stainless steel screws to hold the brass in place. The best part is the rafters. From Stem to stern, little mahogany strips are attached to the bottom of every beam. I have seen countless Ed monk yachts done around the same time period, and none of them have this feature. The Tacoma Boat mart really out did themselves on this one. Enough of my project for now,..I would give anything to see you baby! Idaho is beautiful, but I know that because I have spent a lot of time with the State, but thank you. You are not alone on this site. I try to always live by the thought life's riches come through a journey not reaching the destination. Sounds like you have a diamond in the rough just waiting for you to come "home". When I first brought my wooden boat home I picked it up from a relative and brought it back to the garage where my FIL made it in 1958. When he first saw her he just wanted to put a match to the boat. It's been 2 years now. Between time and (mostly) money she still hasn't seen water. But just laying hands on her for one little fix here and there is so remarkably rewarding. Make your way to Idaho. Lots of great water and good folks awaiting...all three of you! First let me make it clear, I started this website to help people like you and me, folk who wanted to build or restore a boat but were not rich enough to employ an expert to do the job for them. However, I can assure you that when "Orphan Jewel" is restored and afloat you will have gained more in satisfaction and pride than money can ever buy. I’ve come across countless stories of folk who were, at first, dismissed as dreamers but who, through determination and hard work, succeeded in realising their dream. Not only did they realise their dream but became heroes. I recently received a message from another wood boat builder, but unfortunately I experiencing bigger problems then refitting a 43 foot wood yacht,...it's called the local internet services. Yeah I know,..I'll have more luck with the yacht. In any case, please allow me a chance to put my service provider in a strangle hold, long enough to work through this. I really need the help that I was starting to receive before all this started. R Ed Monk jr. on the phone? Okay, I just got my Christmas made for the next few years. My wife did a little research and found the son of the designer of the Orphan Jewel, and his shingle is still out in Bainbridge Island, Washington. After she got him on the phone, I was able to have about a half an hour learning things that I never knew about his father and their family. Still has my head dealing, but he did mention that if I wanted the a certified copy of the original plans, I could talk to the Puget Sound maritime historical society in Seattle, and they would let me talk with a Mr. John Kelly, because Mr. Monk was sure that Mr. Kelly was someone that actually worked on the Orphan Jewel. My heart may need to be jump started. I can't believe that I could have ever got this lucky, and I sincerely do not think I'll be able to sleep for the next 48 hours. Hope you all had such a great holiday. Nice to hear you and your spouse are out there. I had a boat I saved for and the day came when I bought it, not rich just a bit here and a bit there and she became bling at the dock. I just enjoyed the work, did not even take her out much, then one day a lady came and asked if she could have a look, this to me was a social scene come aboard. After an hour or so she exclaimed, "Does it ever move not much. God would I like to live this life." Well I just like to keep it clean, work on it on my days of and if you don’t have a place, like could I sure hears a key. Three years later she had save enough to move on, we still stayed in touch. If I were you, move on to the boat on dry land, do what you can to make it float and start the adventure. Boat people are good people. Love your boat Rick, nothing wrong with poor, that's just a word, you have a yacht a place to call home. This is just to reassure you that, if sometimes there seems to be a delay before your comment or post appears here, it may simply be that it is waiting for me to approve it. Up until recently I didn’t have to approve everything, unfortunately the spammers have found this website, so now………. Approving a message isn’t a problem, it only takes a minute but there are times when I’m off line, out sailing, asleep or whatever.